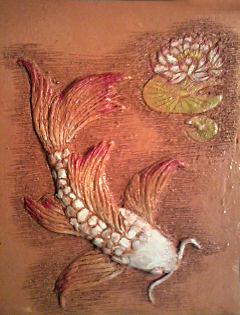 After the second firing, the Koi looks a little more colorful and shiny. It's definitely ready to be given away at the end of the Riverview Holiday Open Studio 2015. If you'd like to check in for the event on facebook for a reminder, you can do so by clicking here. You can't win unless you attend (very bad takeoff on the Florida Lottery tagline to be sure).